There were many frustrations for Joe Schmidt after he saw his Ireland side produced probably their worst performance in a Six Nations Championship during his six-year tenure. 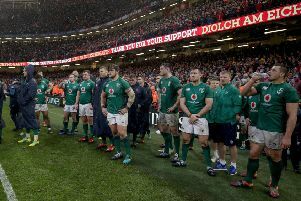 Ireland produced another uncharacteristic display during this Six Nations campaign in losing 25-7 to Wales in Cardiff on Saturday. The win secured the Grand Slam for the Welsh. Wales head coach Warren Gatland signed off his 12 years reign with a third perfect championship - he leaves after the World Cup later this year. It dethroned Ireland as European champions - Schmidt’s side had achieved the Grand Slam last year - and also as the world number two ranked side, Wales now sitting behind New Zealand. Schmidt revealed yesterday that Wales had known their team in advance due to it being published online. “One of the things for us which is probably frustrating is that Gats (Gatland) knows our team before time,” said Schmidt. “It didn’t help with the preparations, that’s always a frustration for us. At the same time these two teams know each other so well, it is like sibling rivalry almost. “It will be a bit like that with Scotland for the first game because at the end the players know each other so well. “So when you know who is going to be where, it is a real advantage,” he added. Pressed further on it and asked if the team had been leaked or if Gatland had been phoning someone, Schmidt said: “No he didn’t phone anyone. It was public. You could see it. It is those fine margins. “You kind of want to keep a bit up your sleeve as long as you can but at the same time that is not the reason we lost. “The reason we lost is they are a bloody good Welsh team and they had a helluva lot to play for. “I think they did an incredibly good job of doing it in their home stadium in front of their home crowd and they got them excited early and that was exactly what we didn’t want to happen but you don’t control those circumstances. Having enjoyed a tremendous 2018, which included beating New Zealand for the first time in Dublin, Ireland performances have dipped. And although they won three out of two in the Six Nations Championship - finishing third - it was a disappointing campaign which had started with a low performance against England at home. With the World Cup now the next focus, and the dip in form worrying supporters, Schmidt insisted Ireland will be at their best for the global event. Schmidt added: “I’d like to take my hat off to Wales, and Warren Gatland.